Farmer's Table - San Diego Dining Dish! As the year starts to turn, my appetite turns to more substantial fare. We are lucky enough to live in Southern California, where produce is plentiful and inexpensive most of the year. The farm-to-table restaurant has been a popular movement worldwide, with many restaurants working with farms to provide the freshest meat and produce. There was even a Portlandia sketch about it a few years ago! With the rash of restaurants claiming farm-to-table, it's hard to tell who is really sourcing their ingredients from local farms, and who is simply using the label to stay on trend. 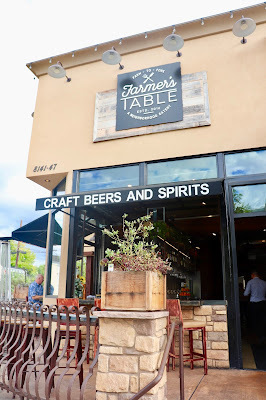 We were invited to check out Farmer's Table in La Mesa, a venture by the folks responsible for Farmer's Bottega in Mission Hills. 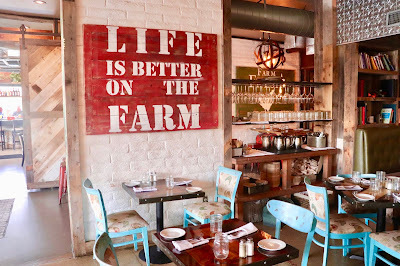 A quick look around the restaurant, and you can clearly tell, the farm-to-table is part of their raison d'etre. 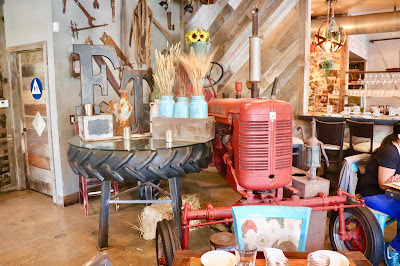 The decor is very country, evoking the theme of the menu, with robin egg blues and even a tractor in the main room. It is comfortable, yet elegant. The dining room is quite large, with separate rooms for the bar area and dining area, to give the feeling of a large, inviting house. After seeing how into the farm life this restaurant was, I was pretty excited to try out some of the food. Sitting down with the menus, it was apparent that Farmer's Table is just that: Farm-sourced, well-prepared food and drink served in a casual-elegant setting. I figure that when dining at a farm-to-table restaurant, a salad is in order. 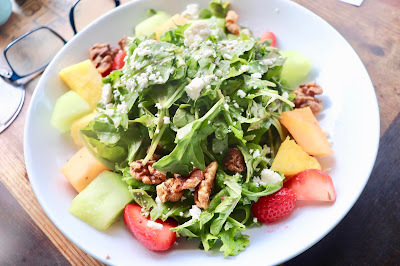 We started out with the Farmer's Salad, a classic green salad spruced up with fresh fruit and candied pecans. The greens were very fresh and crunchy, and the fruits (pineapple, strawberry, honeydew, and cantaloupe) were so sweet and perfect. The salad was large, definitely appropriate as a meal or to split as an appetizer. The menu features a "game of the day" which is not a trivia night reference, but GAME. 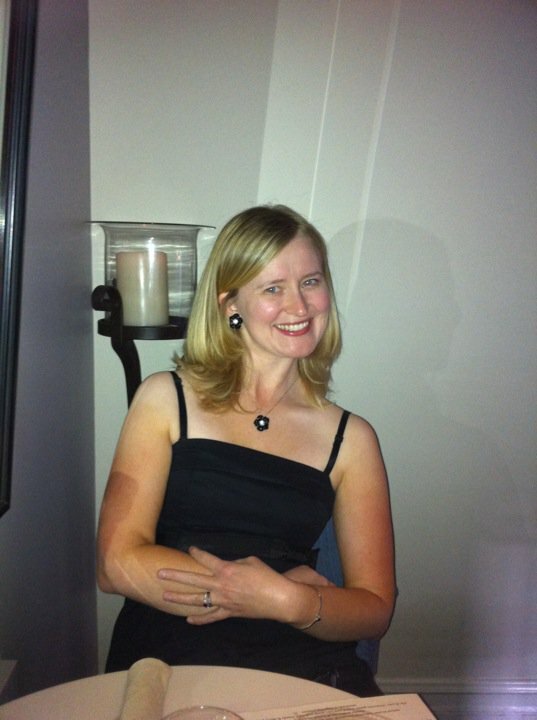 This night featured a buffalo filet mignon, thick and so tender. I normally do not care for filet; I find it flavorless and prefer other cuts, like the ribeye, that have more flavor. 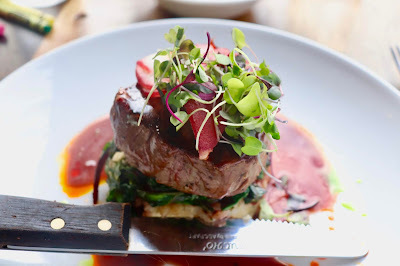 However, with the buffalo steak, this cut was delicious, with a stacked presentation of risotto Swiss chard, and wine-soaked pears to give it appeal to the eye as well as the mouth. 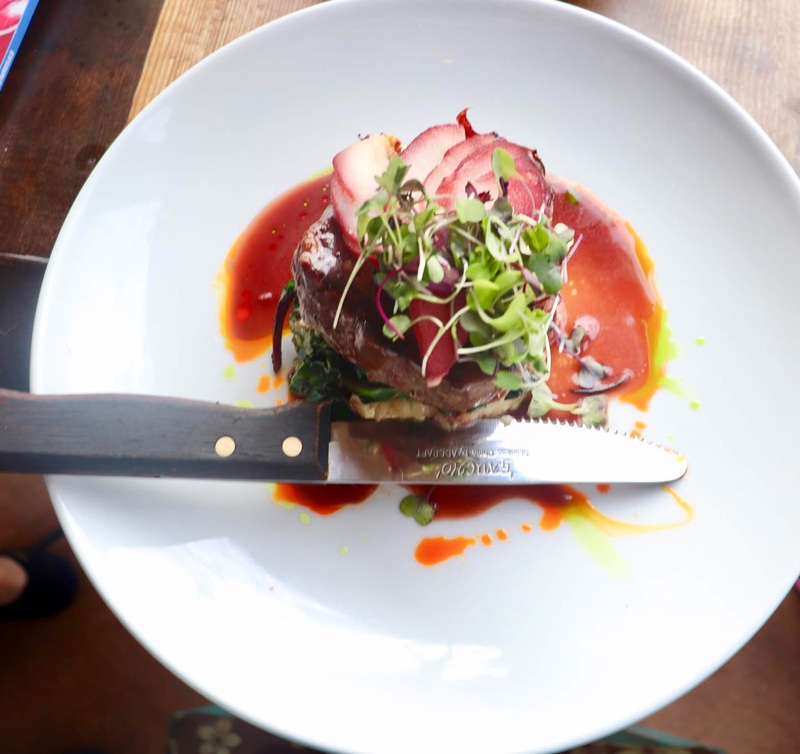 The game of the day is a changing menu item, but based on the flavor and presentation of the buffalo, it's always a good choice. The buffalo was seriously one of the most tender steaks that I've ever eaten. Farmer's Table is absolutely a family spot. 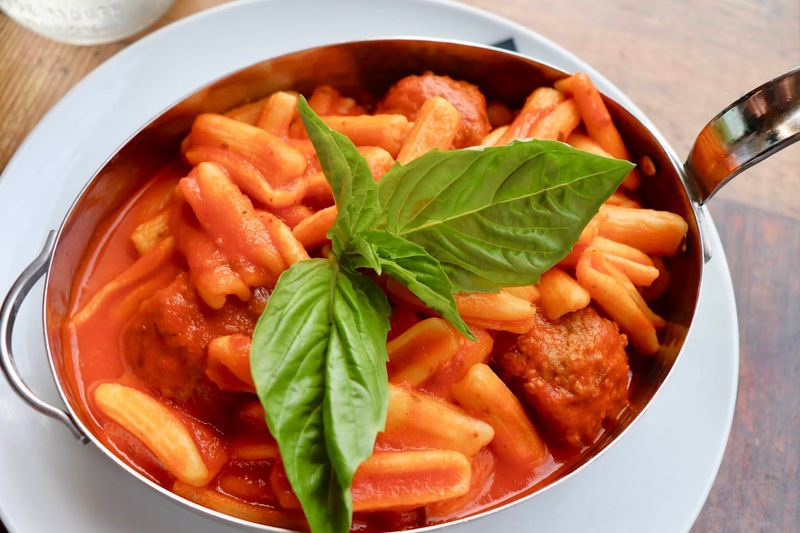 They have an extensive kids' menu that includes plentiful portions and simple flavors to please any youngster. My daughter loves spaghetti and meatballs, so she was excited to have this homemade pasta with light tomato sauce and homemade meatballs. I love family-friendly spots these days! If you've been a long-time reader of this blog, it won't be a surprise that I went for the black and white seafood pasta. 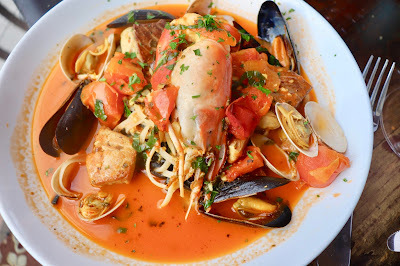 I like even not-so-great seafood, but this was a dazzling presentation of mahi-mahi, mussels, clams, and a gigantic prawn mixed with a briny tomato sauce and homemade squid ink and regular pasta. Sourced from local purveyors of fine seafoods, the shellfish and mahi-mahi was absolutely fresh and delicious. Probably one of the best interpretations of seafood pasta that I've ever tasted. 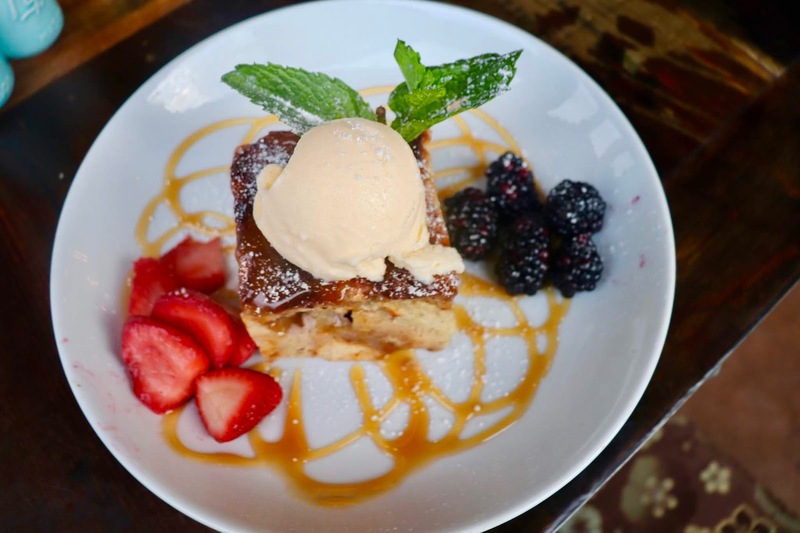 The desserts sounded too good to pass up, and we chose the two that sounded best to us: banana bread pudding and coffee creme brulee. The bread pudding was made well, using leftover bread made into a cake-like texture with the magic of eggs, milk, and sugar. I really can't stand when bread pudding is made more like a cake, and I liked that this bread pudding had the dense texture reminiscent of bread made into a dessert. The coffee creme brulee was unlike anything else that I've ever had. 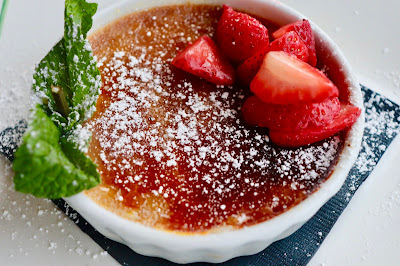 It was just that -- a coffee-infused creme brulee, with no hints of chocolate or super sweet flavor. I loved that the flavor was so simple, bringing out the complexity of the coffee and vanilla infusion, with the creamy mouth feel of a classic creme brulee. Farmer's Table is an amazing addition to the cute downtown area of La Mesa. Offering delicious, farm-sourced meals in a family-friendly yet elegant setting, it's definitely a winner.